By continuously measuring the incoming line voltage, this monitor will detect voltage outside the tolerances that are set. Each of the three-line voltage pairs are checked for voltage level and phase-to-phase balance. If the limits set are exceeded, the response timer begins counting. If the voltage remains outside the tolerance after the response time has elapsed, the DTP-3 will turn off its output relay which shuts down the machine and protects the three-phase devices. You also have the flexibility to set the response timer - a short time may be desired for a quick response or long time may be desired to avoid nuisance tripping. While the output is off, a delay timer is activated to avoid rapid re-starts. The DTP-3 Three Phase Motor Protector is an automatic voltage monitor and control for three-phase power equipment. It prevents costly component failure that can occur when incoming three-phase power surges, sages or drops a phase. The DTP-3 voltage monitor can be installed in most Advantage equipment that uses three-phase power. The monitor takes up minimal panel space (5"H x 9"W) so it can be easily installed in most central cooling equipment and some portable equipment. Advantage installs the DTP-3 to monitor the main incoming power supply protecting all the three-phase devices in the machine. For example, a 3-circuit Titan chiller with process, evaporator and standby pumps need only one CTP-3 monitor, yet it protects all 6 motors. 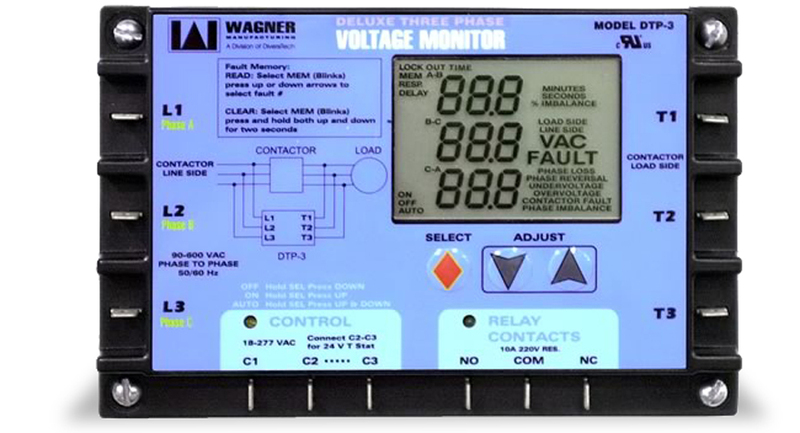 Digital Voltmeter displays instantaneous line voltage for all 3 phase pairs. Automatic Voltage Tester adjusts from 160-600 volts. Adjustable Response Timer (.1 to 20 seconds) prevents nuisance tripping. Digital Display makes for easy viewing and operation. Fault Memory records up to 25 fault causes. For more information about three phase motor protector and power monitor call the Advantage Sales Department at 317-887-0729. Would you like to Download FYI #281 to your browser?